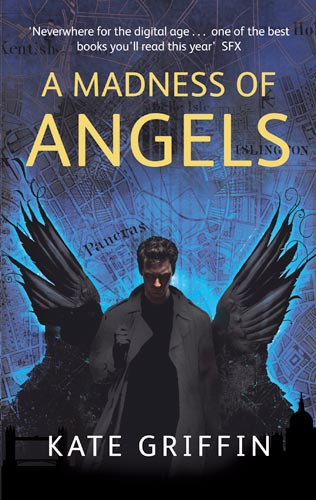 A Madness of Angels is the first novel by Kate Griffin but isn’t a debut novel; Kate Griffin is the name Catherine Webb uses when she’s writing fantasy novels for an adult audience. It’s also the first in her series of books about Matthew Swift, urban sorcerer, and under normal circumstances I’d read several books in the series and make a Reading Canary article out of it, but since urban fantasy happens to have popped up in the Playpen recently I thought I’d post the article now. A Madness of Angels is different from many of the urban fantasy books which Daniel “I’m MLN Hanover too you know” Abraham was talking about in his excellent post which sparked the Playpen conversation, of course, in that it’s got a male protagonist, and is therefore measurably less likely to be dismissed by idiots as being a girl book for girls (though since it’s by a female author the possibility sadly still exists). At the same time, it seems to have been tailor-made specifically to fit the term “urban fantasy”, as though Griffin/Webb were handed the term “urban fantasy” on a slip of paper and asked to write a novel that fitted that definition. It deals, as fantasy does, with fantastic subject matter, and – like Neverwhere before it – it ties that subject matter into city landscapes and urban life to such an extent that the two simply can’t be divorced.